I have hummingbirds getting very competitive and territorial about this feeder I keep there. I am, as we speak, making the balcony area into an urban herb garden so please do not be taken aback by the poor, dead jasmine plant. It will look much better in the coming weeks. I will admit I’m not the best with interior design. I’m just not one of those people. 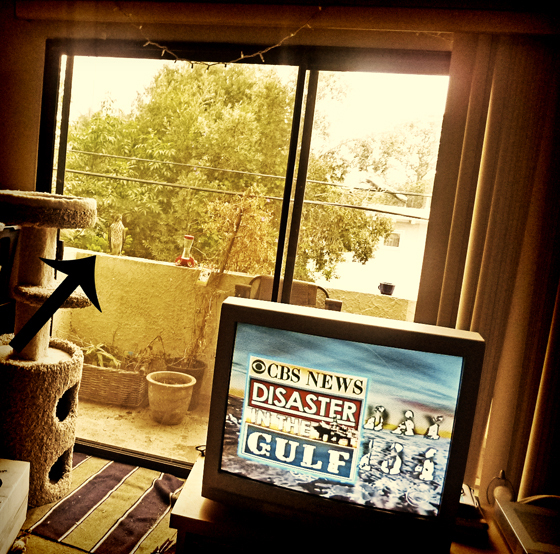 Thus, the “old” TV, the spotty carpet, the ragged balcony area. Anyway, I humiliate myself on multiple levels to bring you this lovely natural event. Suddenly a big old hawk appeared on the hummingbird perch area. I don’t know if he (she?) was there because of the little birds or there because he/she had seen my little wild kitten staring through the window at the birds. Either way, I moved to get my camera. I didn’t manage to get to my Nikon, because that would have entailed putting a battery in and by then, surely the hawk would have flown away. I got my little camera, the Panasonic Lumix, and snapped a quick photo of the hawk. Then, after it flew to a nearby wire, I got a better shot. Big, beautiful, scary things they are.